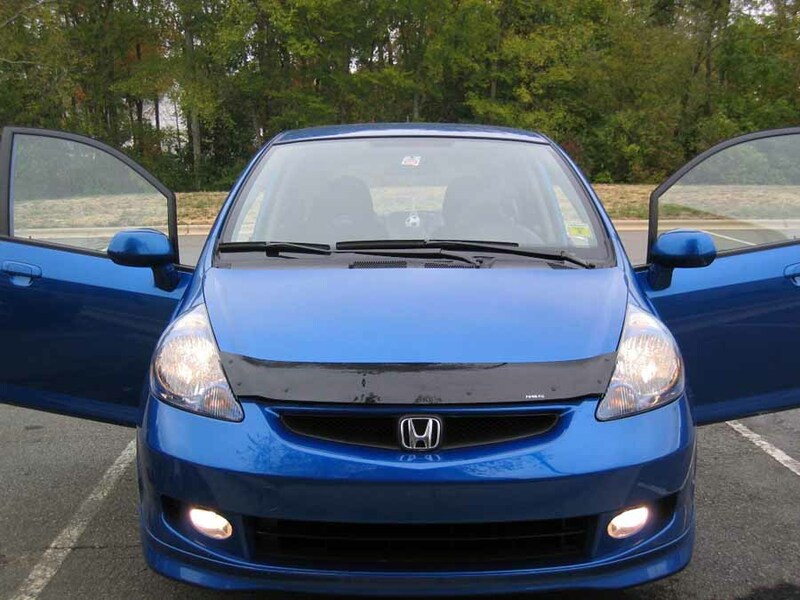 For the new Honda Fit owners on these forums, I would like to introduce you to one of the very best accessories that you can buy for your Fit. This is the OEM Honda Canada Hood Deflector. 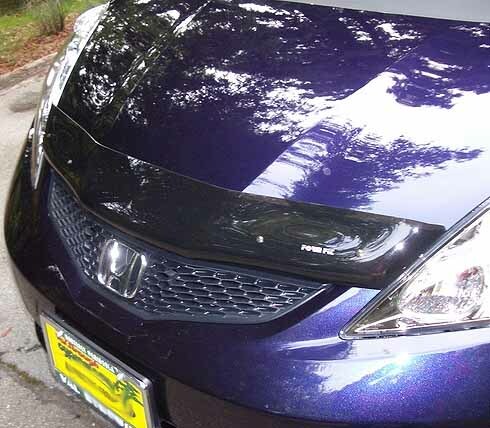 The deflector is a plastic wing that attaches to the leading edge of your hood. It creates a low pressure air stream over your hood and windshield that carries bugs, bird crap, and rocks, that would otherwise hit your hood or windshield, over the roof instead (maybe to hit the car behind you- better him than you, right?). I am currently (and forever) banned from the forums on fitfreak.net. This ban protects the liars and morons who are the administrators of those forums from me exposing them. TOOL is the admin. who banned me the first time for exposing his lies, and JDM DOHC Sir is the admin who banned me for the second time for exposing him as a moron and a bully. I don't mind being banned at all, except for the fact that I am prevented from being able to help other, honest, normal people. After reading a very good review of the Hood Deflector that is sold only by Honda Canada dealers, I phoned a dealer in Vancouver, Canada, and bought one for my new 2007 Fit Sport. I had been looking for a "bug shield" from American manufacturers for months for my Fit, and no one was offering them. The Canadian Honda dealer shipped this OEM accessory to me, and I absolutely loved it. So I contacted Angelo Marzullo, the G.M. of Zeta Products, and convinced him to contact the Canadian manufacturer (Form Fit) of this accessory, to ask for a dealership for the product in the U.S. It took Angelo six months of negotiation, but he got the dealership. He is now able to sell the Hood Deflectors for 1/3 LESS than I had to pay back in 2006 to get my deflector from Canada. Now, to the recent post from a bewildered American Hood Deflector owner who can't figure out how to install it from the instruction sheet. He complains that the metal clips that mount over the edges of the hood won't fit. If I were not banned from fitfreak.net, I could answer him directly, but can't now. So for future Hood Deflector owners on THESE forums, here are the answers to his confusion. 1. The drawing on the installation instructions for the deflector show the metal clips as if the top surface is shorter than the bottom surface that goes on the underside of the hood. The top surface is acutally much longer than the bottom surface. 2. The fitfreak member complains that the clip won't fit over the edge of the hood. In reality, the clip is SUPPOSED to have a VERY tight, interference fit. If the fit of the clips were loose, the wind against the deflector, which is actually a wing, would cause the clip to vibrate and rattle against the hood surface and quickly destroy the paint and the metal of the hood. There are plastic adhesive pads that go on the hood surfaces under the metal clips to prevent wear, but the fit of the clips MUST BE very tight! So, to install the clips, you must use a wooden or plastic mallet, or the wooden handle of a framing hammer, to tap the clips into place. 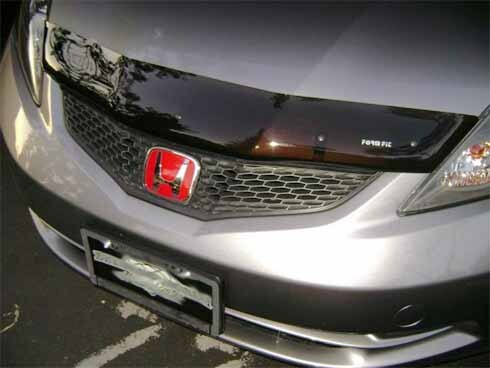 My sincere advice to ALL MEMBERS of these forums is to buy the Zeta Products OEM Honda Hood Deflector and install it immediately on your car. It will protect the leading edge of your hood from rock chips, and will keep bugs from splattering your windshield. I used this product for two years on my '07 Fit Sport, and have used it for the last year on my '09 Sport. If you don't do anything else to your Fit, DO THIS!!!!! Aside from the confused people who have no mechanical experience or knowledge, there have NEVER been any problems with this product for anyone who has installed it correctly. As a result of my posts on the fitfreak forums regarding these deflectors, at least 60 have been sold and installed by competent Fit owners, and none of them has ever had a problem with the performance of the device. If YOU buy one and have installation problems, just PM me. I will be happy to help- the installation is VERY SIMPLE!!!!!!! Last edited by manxman; 08-12-2009 at 04:46 PM. I sent Angelo a PM about this thread. I'm sure that he will either post some photos or at least a link to his web site page that features the hood deflector. Hey, I think I recognise that BBP 09 Fit! Dave your car makes an excellent model. Looks good. Maybe even give you a minute increase in down force to keep your front wheels from spinning with all the massive torque available with a Fit. Yeah, but only at 180+ mph. Ordered one this weekend due to the review thanks!